Clearly, trench excavation affects nearby buildings and causing them to settle. The major factors that cause building settlement are soil relaxation and lowering groundwater. Both of these factors are triggered by the trench excavation. 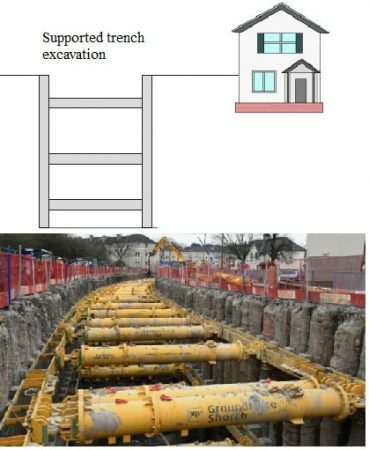 This articles presents the determination of trench excavation influence on nearby buildings by rule of thumb. 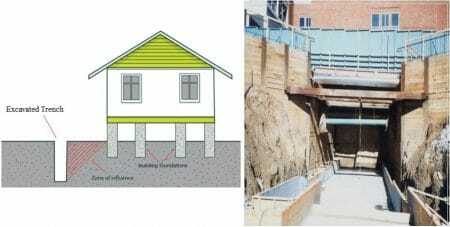 When a trench excavated close to a building, soil relaxation and subsequent settlement of the building is highly likely as shown in figure 1. 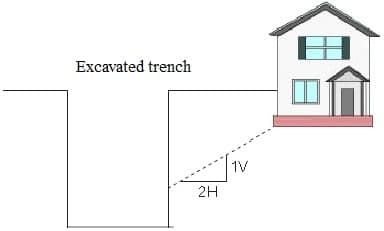 Therefore, it is necessary to provide adequate support for the trench to prevent soil relaxation as illustrated in figure 2. Alternatively, excavate the trench away from the foundation which may not be a valid option all the time. Moreover, a rule of thumb can be used to check whether the trench excavation influences the nearby building or not. Draw a line with 2H:1V from the bottom of the foundation as shown in figure 4. If the trench is within this line, then engineer shall expect soil relaxation and eventual settlement of building foundation. Finally, if the soil at project site is very loose sandy soil, then draw the line with 3H:1V rather than 2H:1V, as illustrated in figure 5. By and large, groundwater moves and seeps into the excavation from the surrounding areas of the trench. This will lower the level of ground water in the trench vicinity area as illustrated in figure 6. 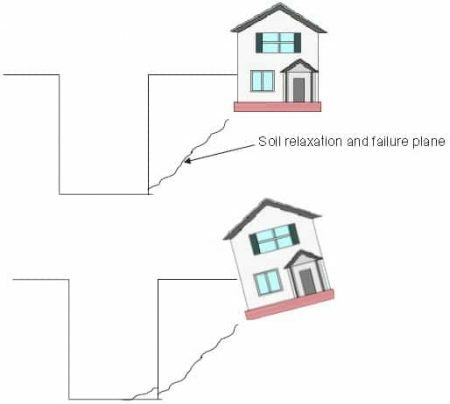 Effective stresses increase as a result of groundwater lowering and consequently the foundation suffer settlement. 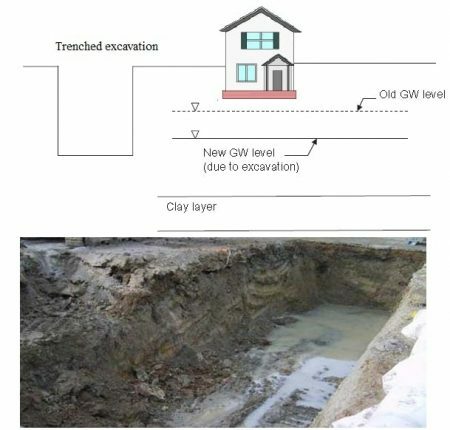 Lastly, lowering ground water increases effective stress in clay layer shown in figure 6, and greater effective stress causes foundation settlement.